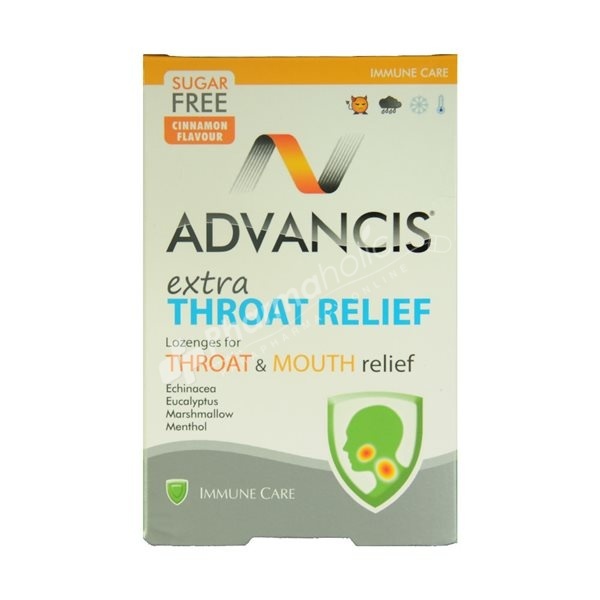 Advancis Extra Throat Relief is a food supplement with Echinacea, Eucalyptus, Marshmallow and Menthol, plant extracts with recognized effects in relieving irritated and sore throat. It is a help to relieve oropharyngeal inflammation associated with cough, cold or flu. Sugar free. Let a lozenge dissolve in the mouth whenever needed, up to a limit of 6 by day. A rest period of 2 to 3 weeks should take place after taking the product continuously for 6 to 8 weeks. Xylitol 53,3%; Sweetener; Manitol; Anti-caking: Tricalcium phosphate; CLF17 (optimized complex of active ingredients based on: Echinacea purpurea, Echinacea (root); Eucalyptus globulus, Eucalyptus (Leaf); Althea officinalis, Marshmallow (Root)) 17,9%; Anti-caking: Magnesium stearate; Polyvinylpyrrolidone; Cinnamon Flavour; Anti-caking: Magnesium Silicate; Menthol (crystals) 1%; Sweetener: Sodium saccharin, Sodium cyclamate. Not suitable for infants and young children and during pregnancy and breastfeeding. Do not exceed the recommended dosages. Its excessive consumption may induce laxative effects. This product must not be used as a substitute of a varied diet.